I hope you are all enjoying the holiday season as much as I am. Christmas music has been playing constantly here at the Jarvis house, and Boomer has been finding all the decorations to be very exciting. It has been a bit of an eventful week. On Monday I had an office visit with Dr. Schwartzman, my neurologist in Philadelphia. We had scheduled this appointment back in March for the purpose of routine follow up. However, it turned out to be a much needed appointment because of the RSD flare-up I've been in since August. As always, I was anxious to hear what Dr. S. had to say about treatment options, since he is the "RSD guru." He found my symptoms at this point to be quite troublesome, and at first recommended the 5 day ICU inpatient high dose ketamine infusion at Hahnemann Hospital. Because of my inability to tolerate IV's at this point, this would also most likely involve surgical implantation of a medical port. The problem with this option is it's not covered by our medical insurance plan and would cost approximately $30,000. When Dr. S. realized our insurance wouldn't cover the procedure, we discussed traveling back to Monterrey, Mexico, to obtain comparable treatment at a much lower price. Given the price difference and the phenomenal quality of care I've received during my previous 2 visits to Hospital San Jose, we're thinking this may be the best option if I decide this is the treatment route I need to take. I'm not quite ready to make these plans yet because I want to try a more non-invasive plan for now. Dr. S. agreed a trial with pool physical therapy 3X a week for a month is the next step to take before making any big decisions. I was extremely fortunate with the timing of all of this. We came home from the appointment in Philly Monday morning and called the rehab department at Chester County Hospital (where I went for pool therapy after the coma), and I was evaluated for pool therapy later that same afternoon. It was like I never left - becoming re-acquainted with the wonderful staff there. I had my 1st therapy session today and I'm hoping for the best! 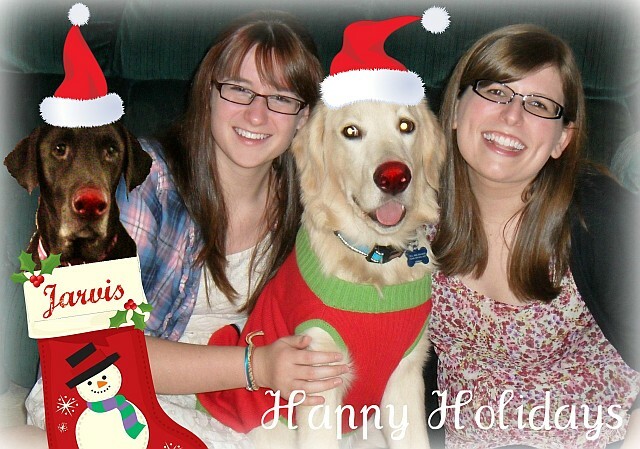 I would like to share our holiday picture with everyone. We always joke that this is the year we may have to photoshop rambunctious Hershey into the picture - well, 2011 is that year! He was just too excited to stay still enough for a festive family photo. Please continue to keep all those people bravely dealing with RSD in your thoughts and prayers. We'll update everyone again when we talk to Dr.Schwartzman in a month. Wishing you all a wonderful holiday season. Thanks for all of your love and support this year. Happy Holidays Kerri and Good Luck along the way !! We Love You ! !